Growing up I was very blessed to have been able to spend months at a time in the Bahamas, Miami, Ft. Laurderdale and the Florida Keys. Being homeschooled, my two cousins, my aunt, my mom, my little brother and I all lived on my uncle’s huge deep sea boat. We kids thought it was totally normal to live on this ship in the most ritzy yacht clubs, doing our school work on the deck and having the blue sea rocking us to sleep every night. I love Island Living! We took a cruise in January to Mexico, Grand Cayman and Jamaica and we enjoyed some of the best island food while we were there. I especially liked the Jerk Chicken in Jamaica and I have been wanting to try my hand at making it since we got home, so what better time to do it than now? My mom and dad came over to enjoy this meal with us, and it was a huge hit. Preheat the oven to 350. Mix the BBQ sauce, tiger sauce, can of pineapple pieces and Jerk seasonings together in a bowl. Put the chicken in a 9×13 baking dish and pour the BBQ sauce mixture over it, reserving about 3/4 cup to serve with. Bake the chicken covered with foil for about 35 min or until the chicken is fully cooked. Set the pineapple rings on a baking sheet and top each ring with two slices of bacon and a slice of swiss cheese. Bake at 350 until the cheese is melting. 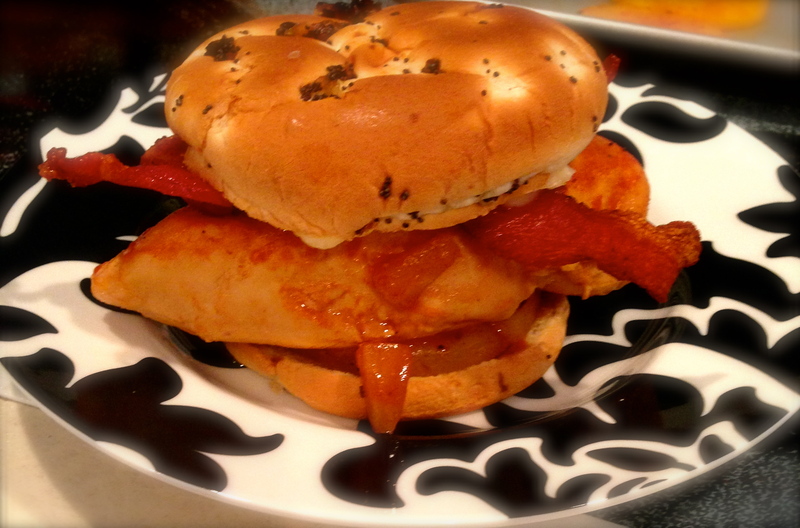 Put a piece of chicken on the bottom of the bun and top with the pineapple ring, bacon and cheese. Put the extra sauce mixture on the table for those who like an extra messy meal. Serve with sweet potato fries and some rum punch. Enjoy!